Be it a pending student loan or money for your family, as a foreigner living outside your home country, there is always a need to transfer home. Sooner or later you will start looking for cost effect and cheap ways to send money home and make an international money transfer from your bank account in Germany. Transfer time : How long does it take to complete a transfer? This also affects the exchange rate since they keep changing over time. Exchange rate : If you are transferring between different currencies (e.g from EUR to USD), then the exchange rate applied by the service provider makes a big difference between different providers. Some providers (e.g., Xendpay) use the exchange rate prevalent on the day the money is sent (transfer is initiated). In such a case the amount received by the recipient is known in advance and does not change. While other providers use the exchange rate at the time the money is received by the recipient. In such cases, the exchange rate is not the same as when the transaction was initiated. The article reviews three different service providers who offer the most cost effective and cheap options for transferring your money from Germany to other countries. Please note that although the options provided are mainly tested for transferring money from Germany, it is still possible to use these services if you want to transfer your money to Germany. The service providers act as an intermediary between the sending in Germany and the receiving bank overseas. Since the transfer is performed by the service provider instead of the bank, they will now decide on the exchange fees and transaction costs. The below image provides an example of how one of the transfer service provider (transferwise) works. All the money transfer service providers use the same principle to work. They have bank account in different currencies. Since a transfer from your German bank account to another EUR bank account is free of cost, you do not incur any transaction cost by the banks. Step 1: Open an account with one of the money transfer service providers reviewed below (Xendpay, Transferwise, Azimo). Due to money laundering laws, you would need to send a copy of your ID/passport to verify your account with the service provider. Step 2: Provide the details of the receipt account to which you need to transfer the money. This recipient could be your personal account in another country or a someone else. Therefore, you can use to make payments for the purchase of goods or services from other countries. Step 3 : Initiate a transfer from the service providers website. You will be provided different options for making a transfer and some of them may incur costs. For example, if you use a Credit card to make a payment, then there is usually a transaction fee of around 1.5% charged by the service provider. On the other hand, normal bank transfer does not incur additional charges. For testing the various service providers, a test case of a transfer from 1000EUR to USD was used. At the time of writing this article, the exchange rate as per XE.com was €1 = $1.0915. This was the cheapest option for sending money from Germany since it allows for free transfer without any transaction costs. Also the exchange rate was amazingly good as you can see from the below example. When sending €1000 using Xendpay, the recipient account would receive $1091.60. This is actually 10 cents better than the prevailing currency rates at that time! So, Zero transfer fees and Zero currency exchange losses when sending money from Germany! You may ask, so how do they make money? The answer is, tips! You are invited to pay what you want for the service as transaction fees. They suggest a transaction fee, but you can change it to zero before making a transfer. The time taken for transfer was also reasonable. It took 3 working days to complete the transfer. This included the one day it took for the local bank transfer to the European Xendpay bank account. The another positive was that the exchange rate prevalent at the time the transfer was made was used during transaction (sending the money). Therefore, you will be sure how much the recipient would receive when making the transaction and this does not change. No compulsory fees (up to €2000 per year), you can pay what you want for the service they offer. This was the second cheapest option for making a money transfer from Germany. Although the transaction fees were higher than the other two options, the exchange rate offered was reasonable. 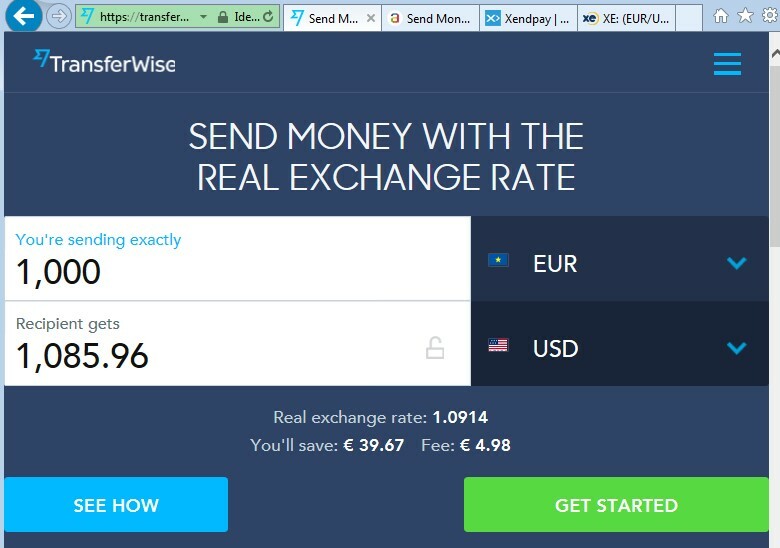 When sending €1000 using Transferwise, the recipient account would receive $1085.90. Please note that this is not the exact amount which the recipient would receive. This is because Transferwise uses the exchange rates at the date when the money is received in the bank account of Transferwise, which would be 2 days later. This could mean that the exchange rate prevalent on the next day is used. This could either be higher or lower than the exchange rate on the day of sending. However, Azimo also uses the exchange rate on the day of receiving the money by Azimo. Therefore, it could vary depending on the exchange rate on that date. 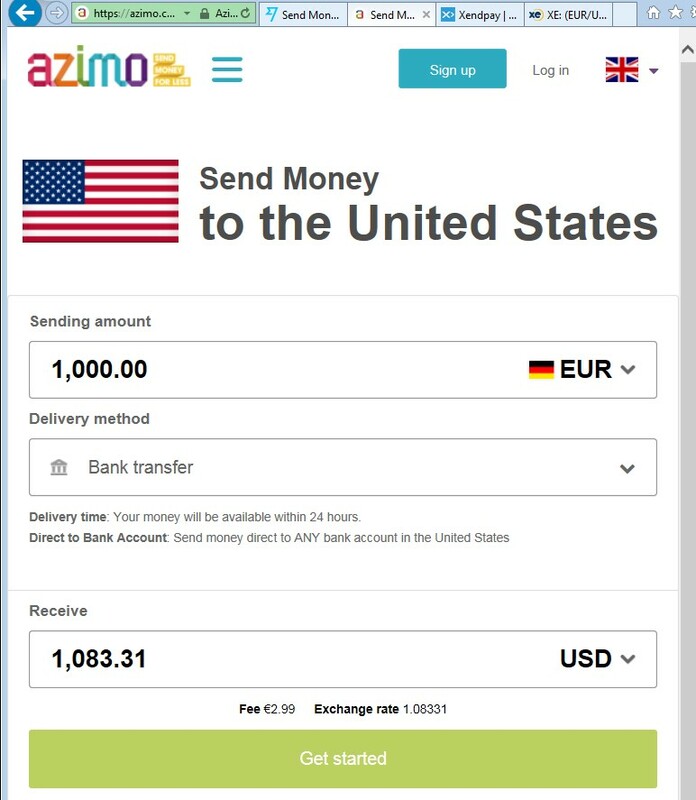 Azimo is a British company that is fast, secure, honest and transparent money transfer services in more than 195 countries around the world via computers, mobile phones, tablets and Facebook. Azimo is the first money transfer service, which is fully integrated with Facebook, so that customers can log in via Azimo Facebook account to transfer money quickly and easily to friends. 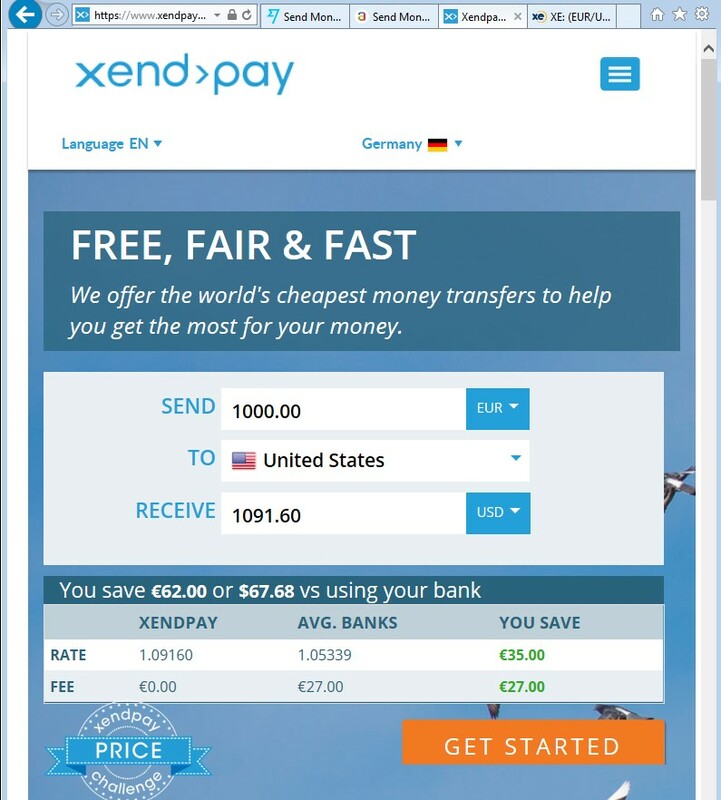 Based on the above results, Xendpay is the the cheapest option for transferring money from Germany.